We are proud to present to you Corona Renderer 1.4 for Autodesk 3ds Max! This release focuses on significantly reducing your render times (just check the stats that have been reported below) and speeding up your workflow, as well as increasing stability. The team has worked hard on this, and I’d like to thank them for taking Corona to the next level. Faster: denoising can reduce render times by 50 to 70% (see Recent Spaces’ blog post here). VFB History with A/B comparisons to quickly check results from different lights, materials, render settings, etc. 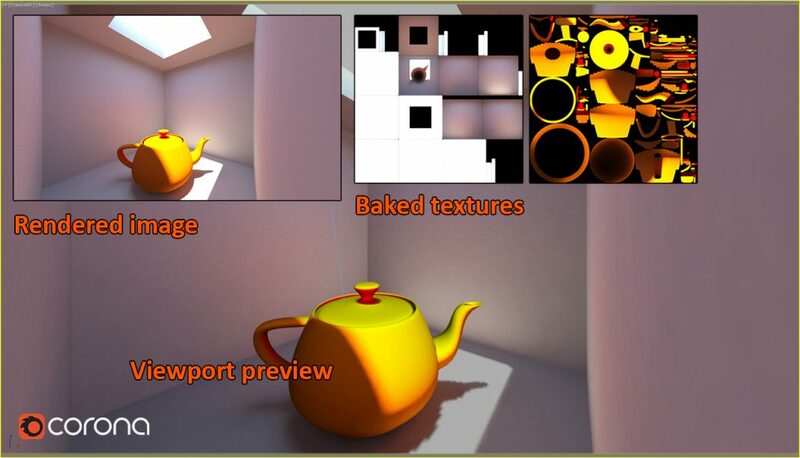 Adaptive image sampling that automatically focuses processing on tricky areas, resulting in even faster rendering. Corona Renderer 1.4 is freely available to all our customers on FairSaaS (monthly, yearly), Box with Subscription and Educational/Student license. Supports Autodesk 3ds Max versions 2011-2017. Before you dive into this lengthy blog post, I would like to give you a short company update. Our team is bigger again – Tom Grimes and Kerry Adams joined our team to help us with marketing and e-commerce related tasks. Tom will not only be handling all our marketing output, but most importantly he will be in close touch with communities to ensure that we know (and do) what our users want. Tom used to work for Caligari Corporation (trueSpace) as a Marketing Specialist until it was acquired by Microsoft in 2009. Kerry is our external consultant who will help us with e-commerce and functional web re-design. Kerry was (and still is) involved in multiple projects, and the most well-known companies he has worked for (that we can mention) are Avast! and JetBrains. Corona Academy is also moving forward so you can expect the first sessions later this year. Currently, we are updating all of the materials to reflect the changes introduced in version 1.4. 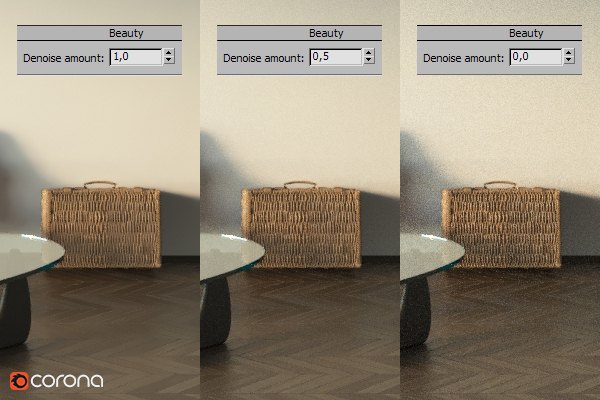 The new denoising feature analyzes noise in the 3D space, so is not just a 2D post-process. You can use it to reduce the number of passes needed to get a noise-free image, with render time reductions of 50 to 70% reported to us by third parties in commercial usage (not by arbitrary measuring tools or carefully crafted test scenes!). It will also remove fireflies from an image, and can be used only in that mode if required. It is seamlessly integrated into the core as one-click solution. The denoising level can be interactively adjusted in the VFB after rendering is complete, so that you are not locked in to the level set in the rendering options. This lets you check and adjust the blending between the regular and the denoised image without having to re-render. Compare the results below, where both versions of the images were created using the same preset render time. This balances out the rendering calculations over the image to focus more processing power on tricky areas like shadows, so you don’t find yourself with a clean image but still needing more render passes as you wait for one problem area to clean up. A note – with the introduction of Adaptive Image Sampling, it is now more useful to use the new Noise Limit for your renders than the old Pass Limit, to ensure consistent quality for every image or frame in the least amount of time. You can now save your render to a history buffer, and perform an A / B comparison in the Corona VFB on any two images from that buffer (including region renders). Ideal for speeding up your workflow when comparing settings, materials or lighting. It’s now easy to add as many render regions as you wish to the Corona VFB, speeding up your workflow when you need to check multiple areas at once in either interactive or regular renders. You can also move the regions at will in the Interactive renderer mode so that they act as a “sample brush”, letting you paint-in areas which you want to refine faster or inspect at better quality. Corona now handles scenes with more than 255 lights without problems and with no penalty to render time. You can now use the Render To Texture option to bake your textures for exporting your models to real-time applications such as VR or games. 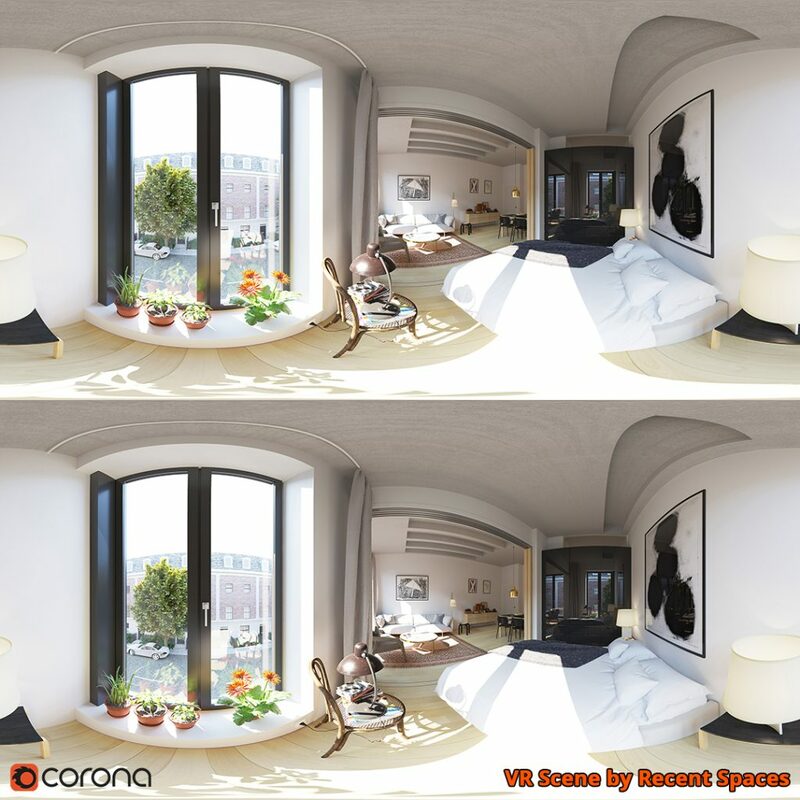 Enabling this option in the Corona camera modifier will let you render your stereoscopic panoramas in equirectangular format. This is our first implementation of the VR camera and we plan to develop this functionality further as we move forward. Look for an additional announcement regarding VR in the near future in a separate blog post! This will speed up viewport performance where there are a lot of Corona objects such as lights, proxies and scatter. The tests below used a GTX 980 Ti with a Corona Scatter set to display 100% of the 100,000 instances in Wire box Previz mode – note the frame rate shown in each, as 1.4 far exceeds the GIF frame rate! This gives a speed up of around 5 times on a typical quad-core i7 when generating instances from Corona Scatter. This gives you the option to handle some effects better in post-processing – such as motion blur. The element offers both World and Camera space to match the needs of your post-process tools. A new “Beauty Pass” render element has been added. This is useful if you need to render multiple denoising versions at the same time, which allows you to mask areas in post-processing to give different denoising levels in different areas of the image. Now you can check any render element in the IR. This removes the need to convert them to a Corona Normal Map. To allow for a more natural (or more extreme!) result, for example when applying colour to leaves, trees, grass, etc. This will improve viewport performance when working with scenes with scattered high poly objects. The DR server no longer requires admin UAC elevation, which previously caused problems with missing textures. An error message has been added if the DR server is run with UAC elevation. Autosave now saves both tonemapped version and raw version of the render, to allow both easily resuming the render and viewing the final result. Removed due to increasing incompatibility with new features and improvements. Previously, increasing contrast on an HDR image would cause highlights to get reduced, acting like another layer of highlight compression. This has been corrected. Viewport performance has been significantly increased when using Corona Scatter to create a massive number of instances but with most of those hidden. The tests below used a GTX 980 Ti with a Corona Scatter set to display 0.1% of 5 million instances – again note the frame rate in each, as Corona 1.4 far exceeds the GIF frame rate. You’ll notice in the write up above that we already have plans for 1.5. Currently, we expect 1.5 to be less revolutionary and more evolutionary, so we anticipate a shorter development cycle for that. Work hasn’t stopped on the Cinema 4D and SketchUp versions, the programmers assigned to those platforms are still working uninterrupted. We’ll continue to release news of those separately. Of course, the development of the features in this 1.4 release is also relevant for the development of those other platforms, so no need to fear that one is developed at the expense of another! MacOS and Linux compatibility are also well underway. We will release MacOS version of Corona Benchmark in few days. Thanks again to everyone involved in Corona Renderer – to our devs, support, forum moderators, translators, beta testers, advisors, partners, resellers, and our users. Well, well, well……. look what’s been cooked up! The reason I didn’t buy Corona 1.3 was that I tried the demon and had problems rendering an animation when using realflow plugin. It would render the first frame perfect but then the fluid part of the animation would get stuck while the reast of the scene would animate. A big THX for all the corona team for this awesome release 🙂 !! Thanks for adding the Velocity pass! you must create another trail option… with big watermark or i dont know its will be better! Installer doesnt work for me with 2015 design, works for 2016. Specified module cant be found! Thank you , it worked doing the manual installation. No estimated date for MODO version yet? Hi, sorry but not yet. But any information regarding new software support will be surely announced publicly. Render to Texture, doesn’t support corona layered Mtl. ?! Is this supporting the new physical material from MAX 2017? Does the De-Noise only work on the final beauty pass? What if you want to comp and control the render elements in post? Hello! Really need the spline mask for corona scatter! Hello! Really need the spline mask for corona scatter! Please do it! I have Corona 1.4 installed in 3ds max 2016. Everytime I use a transparent material with Corona multi-layer material, It changes the IOR (Refraction) of the object at the render time. This is a big bug. Please solve this.